Bright and vibrant, this sunshine rug would add life and color to any space it is placed in. The design is contemporary and the rug is suitable for a modern type decor space with subtle interiors. Customized high-end designer rug exuding an uber-chic look. This is a vibrant colored rug that has a mix of upward and downward arrow designs throughout. 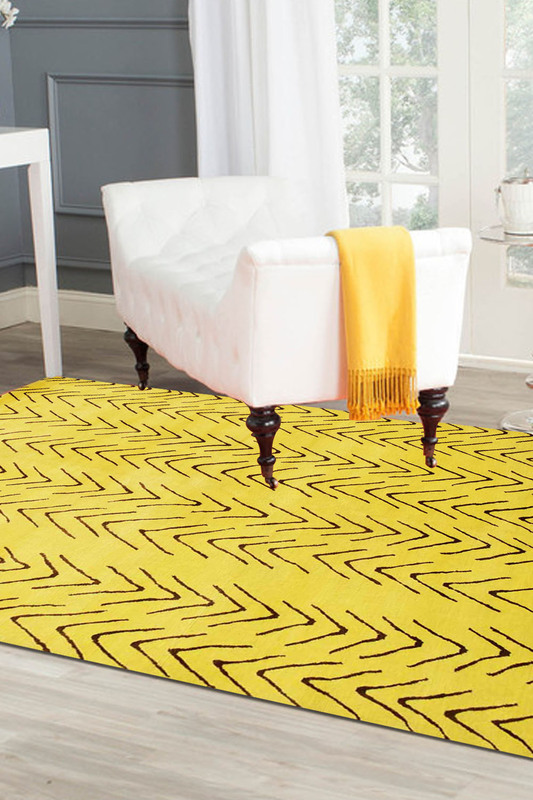 The main background color of this rug is soothing yellow that gives a very vibrant look. Our recommendation is to use this rug as a feature rug in a modern style décor room in such a way that it is the center of attention. The design is originated and created by our Rug Designer- Seth Falk and which is from his geomterical series collection. Please vacuum regularly in the direction of the pile. Avoid direct and continuous exposure to sunlight. Clean liquid spills immediately with a damp cloth or sponge. For hard to remove stains, professional rug cleaning is highly recommended.